Our permanent field station is a modern facility near Shell, Wyoming, on the western flank of the Big Horn Mountains, an ideal setting for geological field courses and workshops. After an extensive renovation, the field station facilities now consist of the Smith Lodge, two new student dormitories, and a new classroom building that are open throughout the year for educational activities by schools, industry, and government agencies. Interested in hosting your own workshop or course at the field station? We are here to help! Please go to our Event Reservations page for more information. This summer, don’t miss an opportunity to study some of the most spectacular textbook geology in the world with friendly staff in a setting that assures you of one of the best academic learning experiences of your life. The Iowa State University Geology Field Camp, offered in cooperation with the University of Nebraska-Lincoln, focuses on applied geology and will help you compete for jobs in the real world or for positions in geology graduate programs! Our welcoming environment encourages learning in a positive atmosphere. At least two permanent instructional staff members from Iowa State or the University of Nebraska are present at all times, in addition to graduate teaching assistants. Areas of expertise of the staff members include stratigraphy and sedimentation, surficial processes, structural geology and tectonics, igneous and metamorphic petrology, and paleontology. We also have guest instructors from industry who lead an exercise on petroleum exploration and give up-to-date information on how to get industry jobs as geoscientists. 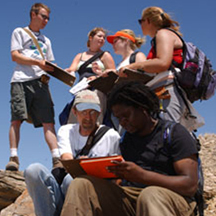 Field camp is the best opportunity you will have to be immersed in geology, learn how to interpret the rock and fossil record, develop three-dimensional thinking skills, make and read geologic maps, and evaluate the data used to make maps. Students enter our program knowing some geology – they leave it with a real understanding of the practical applications of geologic knowledge. The Geology Field Camp is held at the Carl F. Vondra Geology Field Station in the beautiful Bighorn Basin! Still need a summer geology field camp? We have 3 openings left for 2019! Detailed Information: schedule, fees, facilities, etc.